“Backwards / The Remote Viewer” phase. Final live performance of “Broccoli (Version 1)”. A lot of interesting new conventions were introduced at this gig. 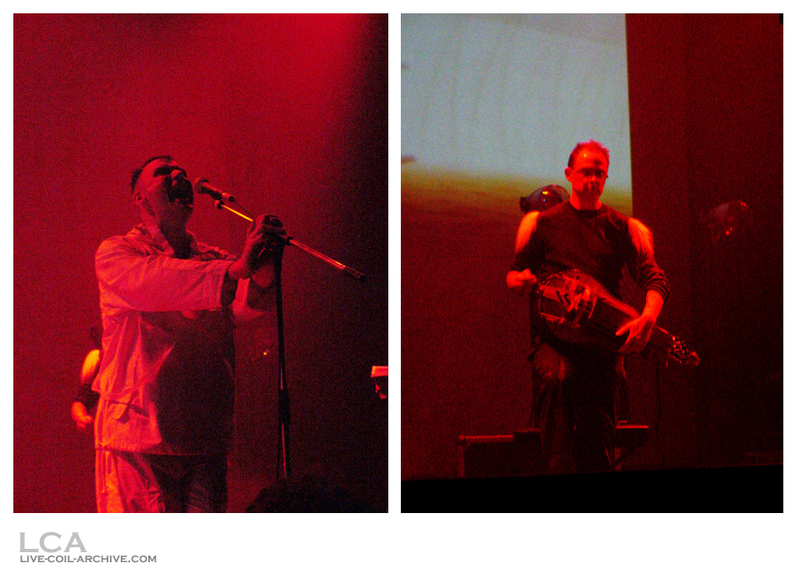 For one, Thighpaulsandra returned to playing with Coil live. Apparently he replaced Mike York just in the nick of time. I’m guessing the rest of the band were getting somewhat tired of the material of this phase by this point, so Thighpaulsandra never played (or learned to play) “Slur,” “A Cold Cell,” “Paranoid Inlay,” or “Sick Mirrors” with the band – the only four songs he ever missed. 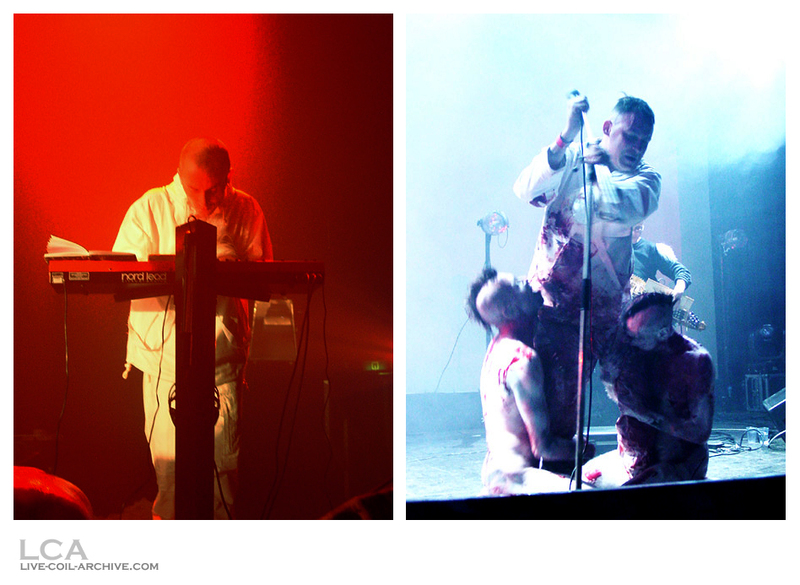 Instead, Coil would play a tighter set for this show and the next as Peter began constructing a new set of live material. You can hear just how much Thighpaulsandra changed the dynamic of the material. 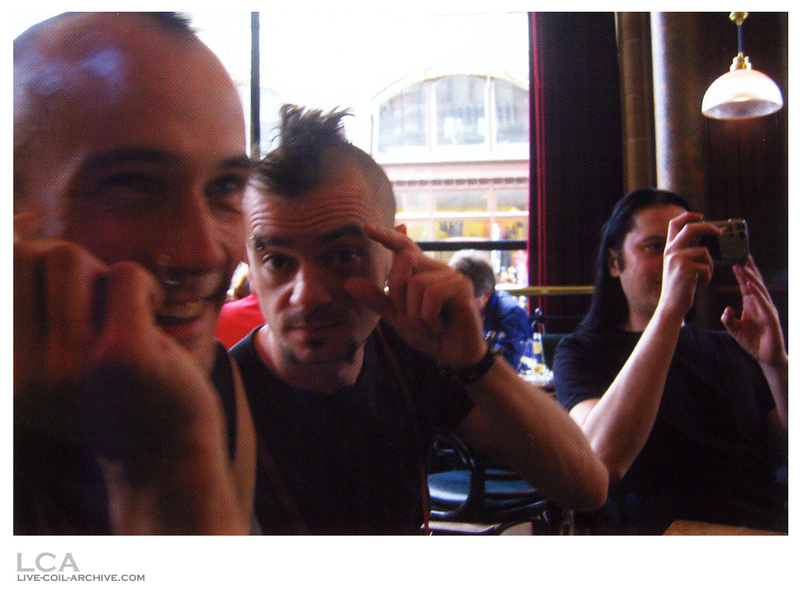 Massimo and Pierce also rejoined the band and would tour with them all the way through to the end of the “Live Four” phase. Their choreography became much more rehearsed and deliberate, starting with this gig. Well, the Victorians presumed everything, didn’t they? Well, the Victorians consumed everything, didn’t they? Well, the Victorians glorified everything, didn’t they? Oh no, no, no, no, whee, yow! For most of the jam, Massimo and Pierce held up their arms to distorted mirrors onstage. Must have been difficult, as Pierce is seen panting heavily after the song. The “Dr. Livingstone, I presume” lyric either references the man himself, Dr. David Livingstone, a famous explorer who contributed to the “Scramble for Africa” movement, or the Moody Blues song of the same name. Before “Broccoli,” John says, “Thank you, thank you. Can we have a little bit more, uh, rather, a little bit less, uh, sort of bright light on the stage, please? It’s sort of swamping us with yellowness.” Peter says, “More moody,” and John continues, “More moody, more moody, please, so we’ll give you a few moments to arrange that, thank you.” Pause. “This next one is about answer were, ancestor worship, uh…it’s about how I don’t get on with my mother, and I don’t get on with my stepfather. I get on with my father, I don’t get on with my uncles and aunts on one side. I sort of respect them, but pretty scared of them on the other side because they do weird things, but not weird in the way I like. They don’t get wired, and they’re not really weird. They don’t get wired, and they’re not really weird. Wise words, wise words, come from the skies. So take a few moments each day to remember your ancestors. They were why you are here now. Like it or not, and I’m not sure I do, I’m not sure I like it, and I’m not sure I don’t.” This version is notable for both Thighpaulsandra’s synth notes and John’s “You never had!” bridge. At some point during the song, Massimo become covered with fake blood – I’m not sure when or how this happened. Before “Backwards,” John says, “Thank you, uh…Me and my shadow, me and my shadow, me and my shadow, the black shadow of Cher. Me and my shadow, me and my shadow, me and my shadow, the black shadow of Cher. Me and my shadow, me and my shadow, me and my shadow, the black shadow of Cher. Beware, beware, the black shadow of Cher. Beware, beware, the black shadow of Cher. Oh, it’s electricity pulsating through the voltage, electricity pulsating through the voltage. Gotta go back, you gotta go further back, further back and faster. Anita Pallenburg said to me, ‘You’ve gotta further go back, you’ve gotta go further back and faster. You gotta go further back and faster. 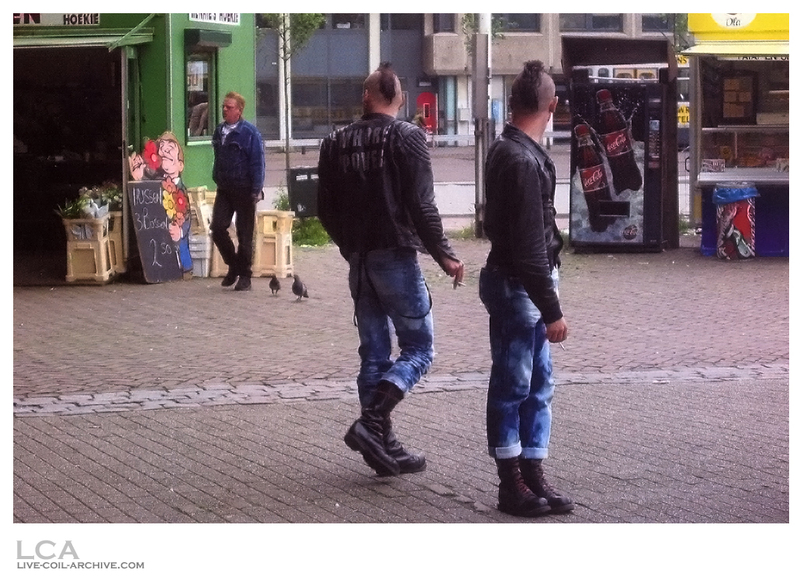 In fact, you’ve gotta go, when you’ve gotta go, when you go, when you gotta go, you gotta go backwards. Backwards. Backwards. Yeah, backwards. Backwards. Backwards. Backwards. Backwards.” By far the best version, both visually and aurally. Massimo and Pierce made a show of eyeing each other up throughout the first five minutes of the song, and at a certain point crawled up to each other and started making out, spitting fake blood onto each other, beating each other on the butts like drums, and even giving each other hand jobs. During the first bridge, the two of them crawl onto John and hump his legs incessantly, forcing him to the ground and coating his white suit in the fake blood. Befitting, I’d say, because this is the first version of “Backwards” in performance that makes it about coming to terms with being gay: “I feel loved / But it’s backwards, but it’s backwards, but it’s backwards / I feel loved!” John had sang the “I feel loved” lyric before, but coupled with Massimo and Pierce clinging to him, it makes me think the song was about John’s personal journey throughout his life of coming to terms with being gay, despite being raised in a very conservative/repressive English household. EDIT #1 – comprised of AMTs owned by DraZen (onstage, AMT #2), Paul Klaui (background), and Claus Laufenburg (front of stage). SBD #1a 8+/10 No 52 min M1 (? ), 256kbps MP3 One audio track, no indices. “Anarcadia: All Horned Animals” fades in. SBD #1b 9-/10 No 52 min M?, 320 kbps MP3 Same as SBD #1a, but circulating as four separate MP3 files and sounds better. AMT #1 9/10 No 16 min M0, 720 x 576 AVI Lineage: Mini DV > Sony Handycam DCR-H96E by Firewire > Sony's Play Home software > .avi video file. Surfaced on November 19, 2016, as a bonus in Black Sun Productions’ alternate, free Colour Sound Oblivion Soundcheck footage. The master surfaced on December 27, 2018. AMT #2a 9/10 Yes 57 min M0, 720 x 576 AVI Lineage: Mini DV > Sony Handycam DCR-H96E by Firewire > Sony's Play Home software > .avi video file. Surfaced on November 23, 2016, as the seventh installment in Black Sun Productions’ alternate, free Colour Sound Oblivion. Onstage angle. Stretched to widescreen. Used on Colour Sound Oblivion DVD #6. The master surfaced December 27, 2018. AMT #2b 9/10 Yes 57 min M1 or M2, 720 x 576 MKV Possible lineage: PAL DV(?) > ? > DVDr (thanks to Jon Witney!) > DVD (duplicator) > Direct Stream demux of video and audio (m2v, wav) > wav to flac via official flac exe (same bit depth / frequency range) > video and audio muxed to mkv via MKVToolnix 13.0.0. Slightly worse video quality than AMT #2a. "Amethyst Deceivers" has repeated frames at 21:25.440 + 27:14.560, "Broccoli" at 33:12.40 + 33:35.280, and "Backwards" at 46:32:920 + 53:47.360. Released on an unofficial DVDr not even listed on Discogs. AMT #3 6/10 No 15 sec M0 (? ), 320 x 240 MP4, Facebook Shared on the “Coil” Facebook page by Massimo on December 24, 2016 for Christmas. You can see the taper in AMT #2. 15-second segment of “Backwards” only. EDIT #1 8+/10 Yes 58 min M1, MKV 3-camera angles (amateur). Gig footage uses a mix of SBD (and a rather compressed copy at that) and camera audio; there are occasional sync problems and times when both audio sources play simultaneously. Some banter/space in-between tracks is also cut. Officially released as Colour Sound Oblivion DVD #6. EDIT #2 9/10 No 58 min M1 (? ), 720 x 576 AVI Possible lineage: Master tape for AMT #2a > digital video file > editing software > copied onto a Mini-DV tape as owned by Black Sun Productions > Sony Handycam DCR-H96E by Firewire > Sony's Play Home software > .avi video file. Tape labeled "ENO TAPE." Edit of AMT #2a with the desk recording. Sync issues and minor cuts throughout. Tape obtained from Black Sun Productions live Coil archive, surfaced December 27, 2018. AMT #1 + AMT #2a – Recording download link (archive.org). 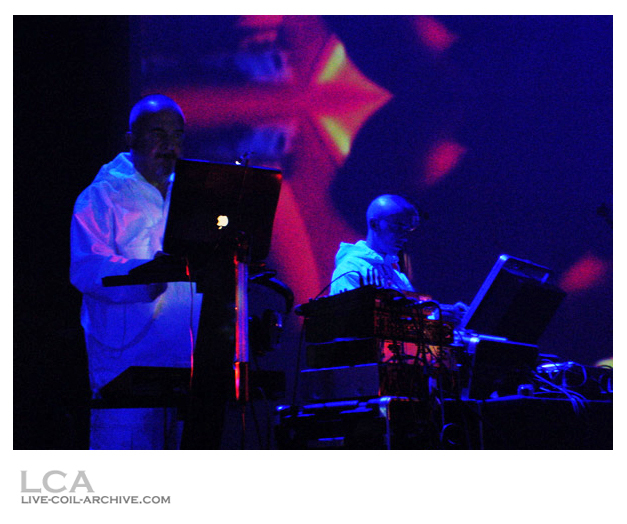 EDIT #1 – (Colour Sound Oblivion DVD #6) Recording download link (archive.org).